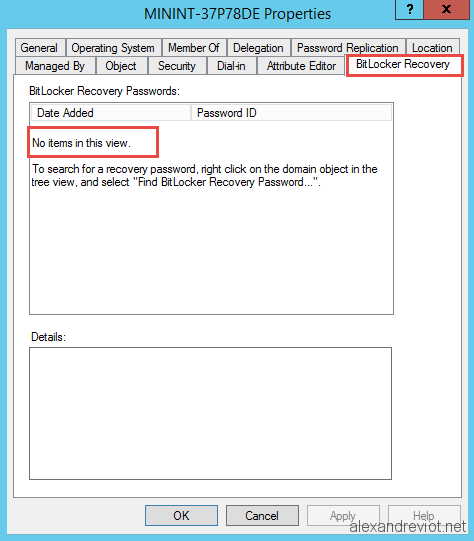 Before searching your computer in Active Directory, you need to install a plugin to display Bitlocker Recovery Key information. 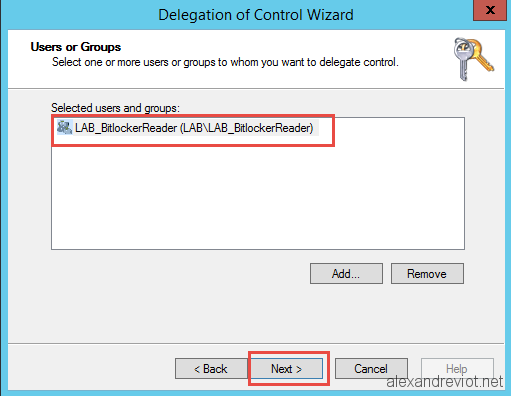 It is integrated in features since Windows Server 2008. 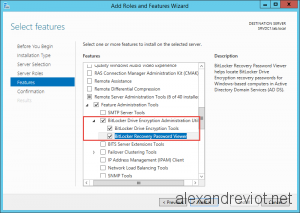 On Features Page select Remote Server Administration Tools. 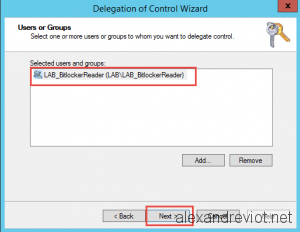 Check Bitlocker Drive Encryption Administration Utility. 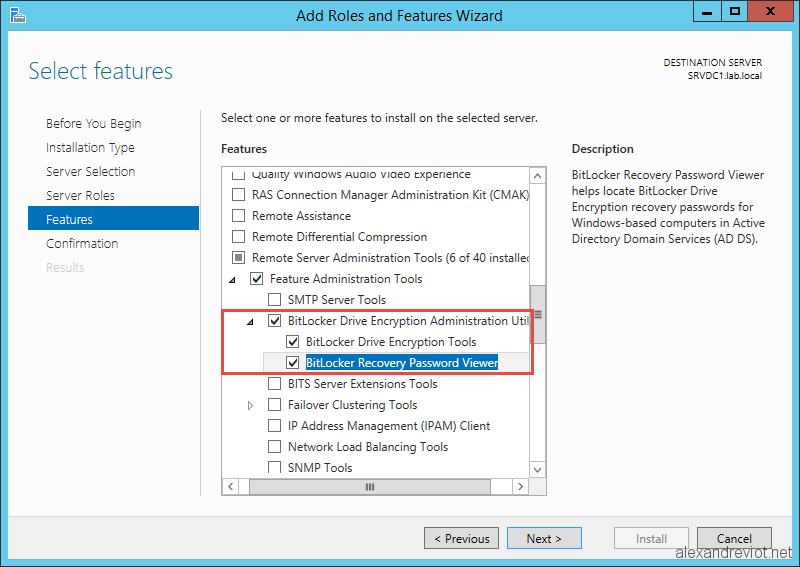 Check Bitlocker Drive Encryption Tools. After the installation, just close and open Active Directory Users And Computers again. 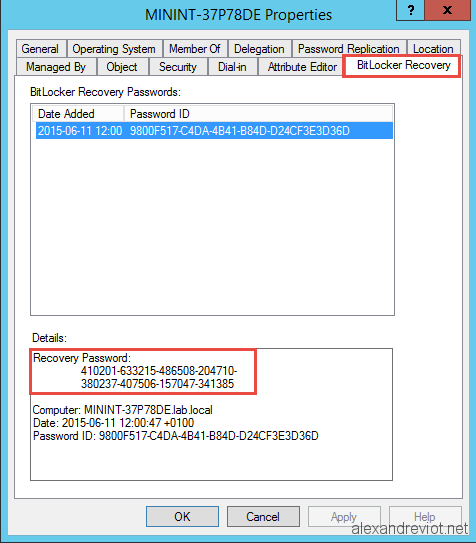 Recovery Key : this key must be given to the user if needed. Right click on your domain name. 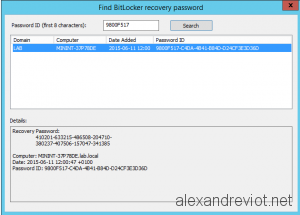 Select Find Bitlocker Recovery Password. Enter the first 8 digit and click Search. You will find the computer and the recovery key. If a helpdesk team exists in your enterprise, you maybe want to give them the right to display this information. However, Recovery key is a confidential information and standard users can not view it. We need to delegate some rights on the targeted OU to specific group. 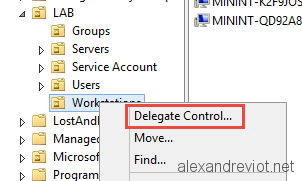 Right click on the targeted OU and select Delegate Control. Add groups which need to view Recovery Key. 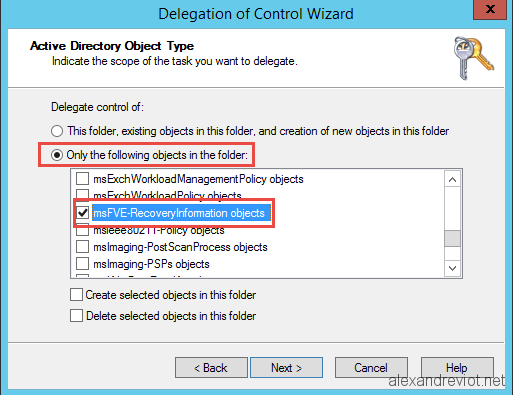 Choose Only the following object in the folder and check MSFVE-RecoveryInformation objects. Give Full Control on this object. 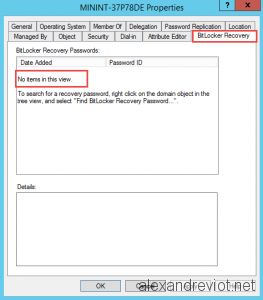 Helpdesk user can now view Recovery information. In the example above, I set the right to Full Control on the property. The explanation is that the property has the confidential bit and if you want to read it, you need to have the Control_Access flag. 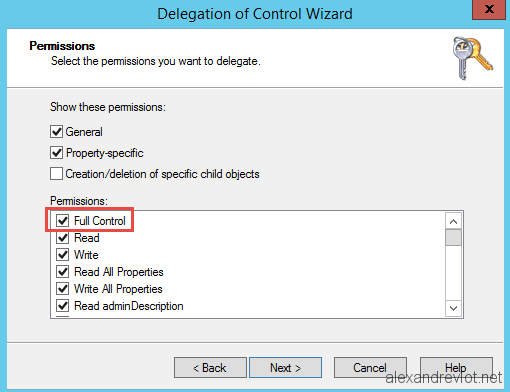 Control_Access is granted if the account has Full Control in the delegation wizard. 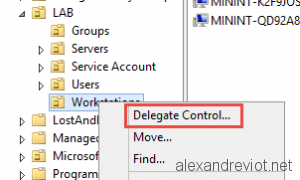 Otherwise, it is possible to set the Control_Access flag with LDP.exe to read only. 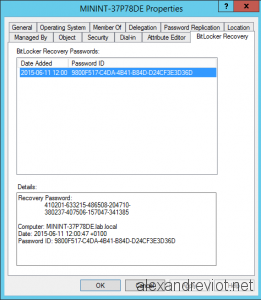 You can get more information about Bitlocker here. 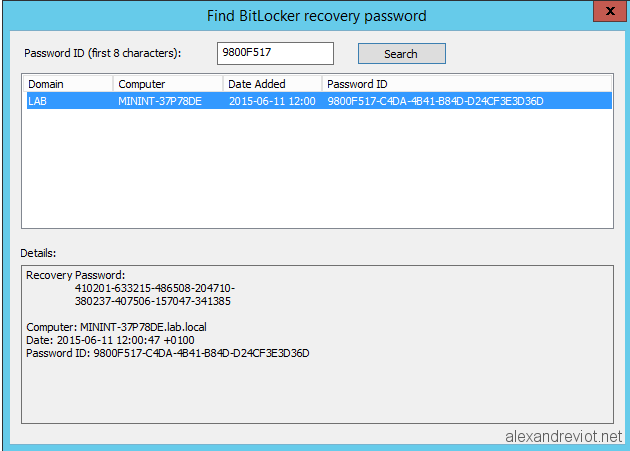 This entry was posted in Active Directory, Bitlocker and tagged access, active, bitlocker, computer, console, control, directory, key, ldp, recovery, user. Bookmark the permalink. 1 question, Will this affect any permissions already previously delegated to the group ? Thank you for posting this article. I found it very useful. Exactly what I was looking for. Much easier than trying to run the VB scripts Microsoft provides. 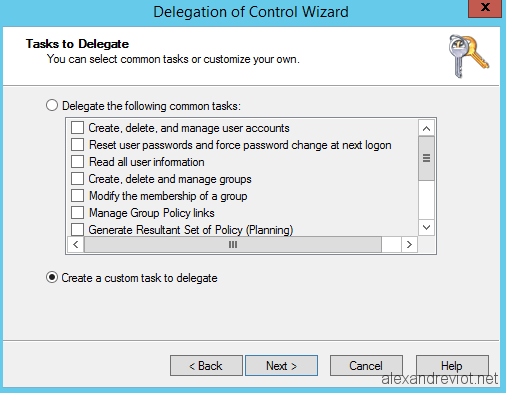 I knew there had to be some property that could be accessed via the delegation wizard. Thank you for getting me there quicker. Very useful. The screenshots are much appreciated!